Air compressors are one of the most commonly used power tools as they provide an easy and quick way to power a great variety of tools. They are compatible with water sprayers to paint tools and everything in between, with some heavy duty options as well. Their key notable feature is that they compress air and store it. The compressed air is later released with force the magnitude of which depends on the pressure with which it was stored. The most common type of air compressors is the single piston model and it is used in most households. They are the most compatible type of air compressor that can aid the operation of many other tools. They are either powered electrically or by gas and the force is used to move the piston which compresses the air and moves it to the storage tank – ready to use. The piston moves only until a certain amount of air has been compressed. When it reaches its specified limit, it stops, and as you use your compressor and lower the pressure inside it, the piston starts compressing air again. There are two main types of air compressors: stationary and mobile. Stationary compressors are larger and can be used for longer periods as they have large tanks which are usually stored vertically in order to save space. Mobile compressors, on the other hand, don’t have the same capacity but are much more useful as you can roll them wherever you need to use them. 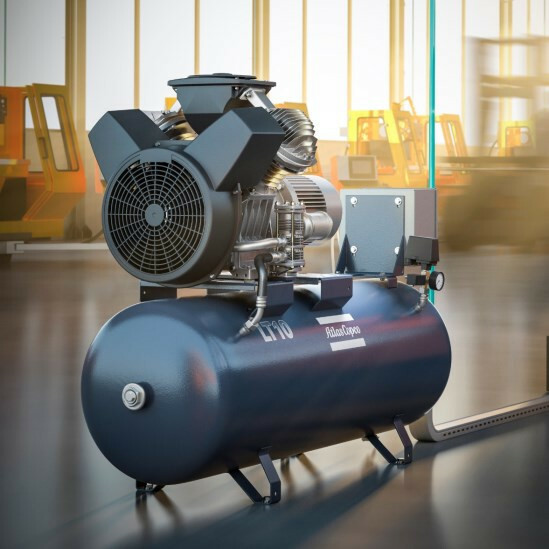 When it comes to being able to compare models and specs, air compressors online tend to have a more detailed explanation of the features which is recommended so that you can determine if the compressor you are getting is right for your needs. Another very important aspect to consider when looking for the best option for you among the different air compressors online are the control systems. They are designed in three variants. The first one is the start/stop system and it is best for projects that only require intermittent air. This one is also compatible with machines that start fewer than six times per hour. The second option is meant to proide constant speed control and that is best for machines that start more than eight times per hour. This is due to its design which is meant to prevent over-persistent starts and stops. Lastly, there is also the convenient option of dual control, which allows one to set the auxiliary to either start/stop or be in a constant speed mode.